I run multiple computers in my home and I also have one in the office. I often get frustrated that I don’t have the same favourites with me everywhere I go so I have come up with this method to synchronise my machines so that I have the same favourites with me, wherever I am and whichever machine I am on. In this article I will use offline files to ensure that the favourites are the same on both machines. This method is not simple but it is the best solution I have found. This method does require minor registry hack and also removes network security from your favourites (not that security is all that important for favourites). This solution has worked for me and run steadily without problems. If you are uncomfortable doing registry hacks, I believe your only options for syncing is to copy the files manually or to get a third-party application to look after your syncing needs. I prefer to stay away from little additional utilities if it is possible to achieve the same result without them. With any method, I would strongly recommend you backup your favourites by starting up Internet Explorer, clicking on file menu and selecting “Import/export”. Follow through the wizard to export your favourites. 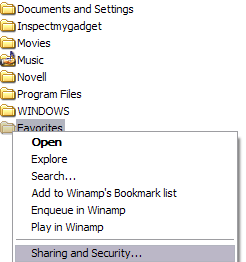 The “favorites” folder cannot be shared directly, so that other computers on the network can see them. That is what makes synchronising these your favourites so difficult. If you could share them, you could easily use SyncToy to make the folders the same on each computer, but as this is not possible, we need to setup a fairly complicated system. This method will not work with firefox as firefox stores its favourites a different way. Before we begin you will need to define which computer of yours is the host as it is its job to hold the original copy of the favourites. I would recommend a desktop which is regularly on and probably the most powerful of your fleet unless you would like to run one as a dedicated server. Whichever you choose, the drain on this machine will be minimal. You are able to have one or more machines connecting to the host. I will refer to these machines as the recipient. We are removing much of the security for your favourites. If security is an issue for you, please investigate further. Please ensure that you have a backup of your “Favorites” before proceeding. I see this as low risk of something failing, even lesser of your favourites disappearing but you can never be too careful. Please do the following on the host machine. If you do not have a favorites link here, right click on the grey area and select properties. You will now have a copy of your “Favorites” in the root of C:. We now need to share this folder. As mentioned earlier, the next step opens your favorites up to users on your network. Whilst this is fine for home use, you may want to be careful trying such things in an office environment. 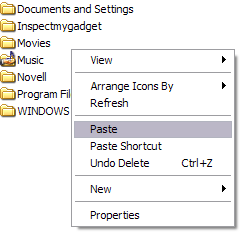 Right-click on the favorites folder you pasted in the last step. Tick “Allow network users to change my files” if you’re happy for the favourites to be changed by the recipient. You have now shared the newly created “Favorites” folder to other users on your network. The final step on the host machine is to let Windows know where to find the new folder. The old folder will not be used after this step. Please make note of this change because if you want to change your computer back to defaults, this is one of the settings you will need to change. This is good time to back up your registry, Go into the file menu and select export. The change we are making is a minor one but if you have a cat which walks on your keyboard, you may accidentally change something you didn’t want to. You can either navigate through to these by clicking on folders just as you would in explorer or you can press F3 and do a search. There will be multiple similar entries. The bottom of the page will show you the full path you are at. It is crucial that you check and double check these key names. Editing the key in “Shell Folders” as opposed to “User Shell Folders” will have no effect. Double click on the keys on the right and change the value to “C:\Favorites” for this key. 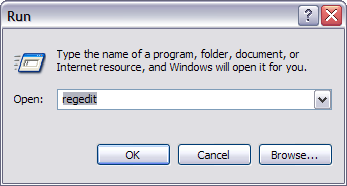 Click “OK” and close Regedit. Make note of this site address so that you can come back to it. Saving this site in your favorites will not work because your computer will direct to your new favorites folder once you restart your computer. Restart your computer, you will not see results until you have done this. You can now ensure that this has worked by right clicking on your “Favorites” and selecting properties. You should see location as “C:\” and the correct folder name as “Favorites”. The hand under the icon proves that it is shared. You have now completed all tasks on the host machine. Setting up the recipient machine. Mapping to the folder from the host machine. 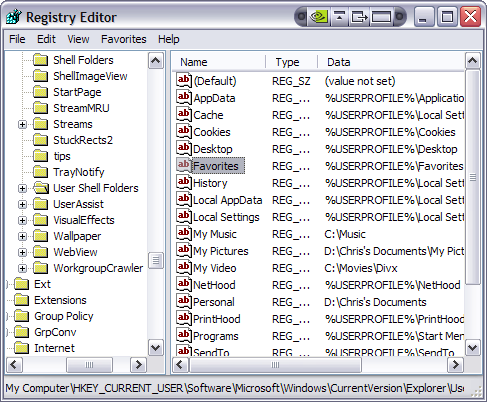 Registry hack to direct your computer to the new “favorites” folder. Mapping your “Favorites” folder from the host machine. There are many options for how to do this, that is why I am using the term “Mapping”. The method I am using does not require a physical map of the drive, you just need to locate it. 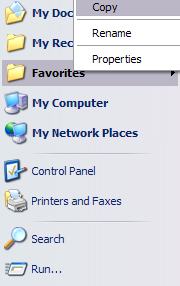 You should see your “Favorites on (Host Computer Name)” in your “My Network Places”. Take note of your “Host Computer Name”. If it has not shown up yet, press F5 to refresh the window. If it still does not show up, try navigating to it by searching your network. Double click on it to open it. If you do not have this option, click on Tools, Select Folder options. You should now see the blue and white arrows attaching themselves to your files and folder. This allows these files to be available to you when you are not attached to your host computer via the network. This is very similar to the registry change you did on your host machine. We are changing the same key. The difference is that we need to change the value to the path of the shared folder on your Host Computer. Use the path “\\Host computer name\Favorites”, in my case, the host computer name is Monica. That’s it, both your machines will both be using the same “Favorites” folder, allowing you to add a favourite and having it viewable instantly on both. When the machines are not connected by the network, they will both work individually. You are able to add new favourites and they will sync when you reconnect your computer to the network. If you have multiple machines, you would follow the recipient steps on each of them to get each of them to sync. I hope you have enjoyed this How-to and found it useful. Check out Inspectmygadget.com for more How-To’s. How-To: Synchronise two folders using SyncToy. How-To: Synchronise two folders using xcopy. 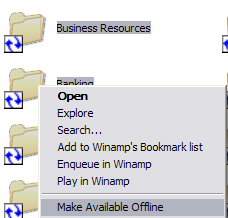 How-to: Synchronise your document folders between XP and Vista, using offline files. Thanks for this article. I plan on implementing this on my own computers. I also plan on doing the ‘favorites’ sharing in your other article as well. I was wondering if I put the favorites folder in the shared my documents folder rather than c:\favorites would that eliminate some of the steps? Hi John, You got it in one. To store your favorites in your My Documents will illiminate many steps. That is how I do it. The only reason I haven’t shown that in the articles is to keep the two seperate for visitors wanting to do one or the other. Matt, there are a fair few sync programs that will do the trick, but I like synctoy. You can then schedule the folder sync to run using scheduled tasks. You can make the sync occur as you turn the machine on, off or at set times. You can also create a shortcut to run the sync on demand. 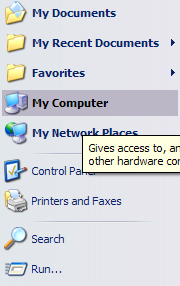 The “favorites” folder cannot be shared directly, so that other computers on the network can see them. not to be the case. I was able to share the favorites folder and use synctoy to synchronize them. The host computer is running XP Home.